Just five minutes from the ancient ruins of Tulum, this beautiful hacienda-style resort provides Unlimited-Luxury in exquisite tropical settings. This superb resort features finely appointed luxury suites and rooms. Dreams Spa by Pevonia, two pristine swimming pools, chic bars and lounges, gourmet restaurants and endless daily activities and nighttime entertainment. 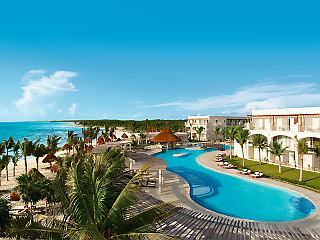 This entry was posted in All-Inclusive, Destination Wedding and Honeymoons, Hotels and Resorts, Mexico, Riviera Maya, Weddings/Honeymoons and tagged Dreams Tulum Resort & Spa, Honeymoon in Mexico.